The Sound Sensor BT80i is a microphone followed by an internal amplifier. This microphone is mounted at one end of the box. The sensor measures variations in air pressure in the measurement range between -45 and 45 Pa caused by a sound wave. Because of the high sensitivity, the sensor is very much suited to detect short pressure pulses. This offers the possibility to measure the speed of sound. The sound sources that can be used with the microphone are tuning forks, electronic keyboards, and musical instruments. You may also investigate a human voice or a whistle. Within a certain range, the sensor can also be used for dB-measurements, a suitable calibration is present in the Coach software. • display the Fourier transform (FFT) of a sound. 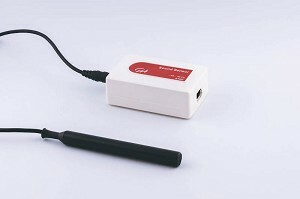 The Sound sensor can be directly connected to analog BT inputs of the CMA interfaces.